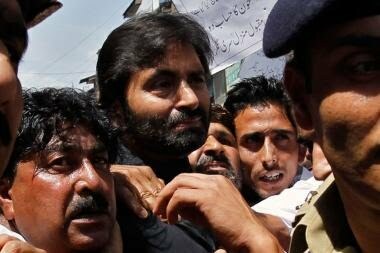 Srinagar: Jammu and Kashmir Liberation Front (JKLF) Chairman, Muhammad Yasin Malik, was on Tuesday shifted from Jammu’s Kot Balwal jail to the Tihar Jail in Delhi, official sources said. He was brought from Jammu to Delhi on an Air India flight in the evening, the sources said. Malik had been booked under the harsh Public Safety Act (PSA) and shifted to Jammu on March 7. Under the PSA, any person can be kept in detention for two years without any judicial intervention. Meanwhile, the NIA on Tuesday summoned former PDP legislator, Ajaz Mir to appear before the agency on April 12 in Delhi in connection with the arms loot case being investigated by the agency. On September 28 last year, Special Police Officer Adil Bashir Sheikh had decamped with seven AK-47 rifles of the security guards and one pistol of Mir from the official residence of the legislator in Jawahar Nagar area of Srinagar city. The SPO has since joined the militant ranks.